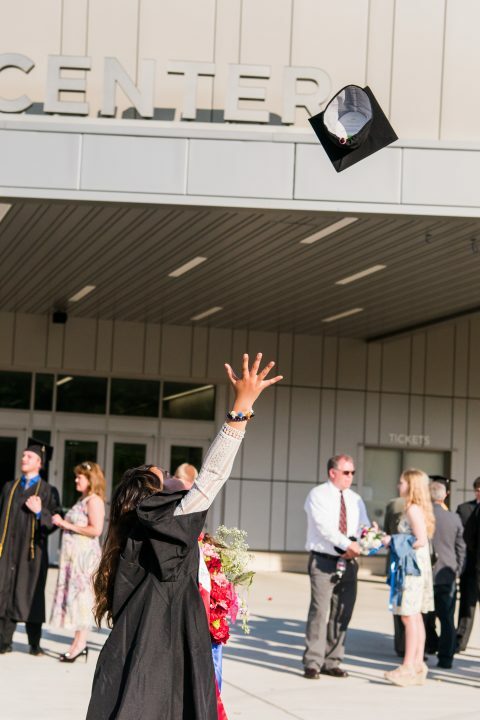 Thousands of Retriever graduates, family, and friends streamed into the new UMBC Event Center last week to celebrate spring commencement, as the ceremonies returned to Hilltop Circle for the first time in two decades. 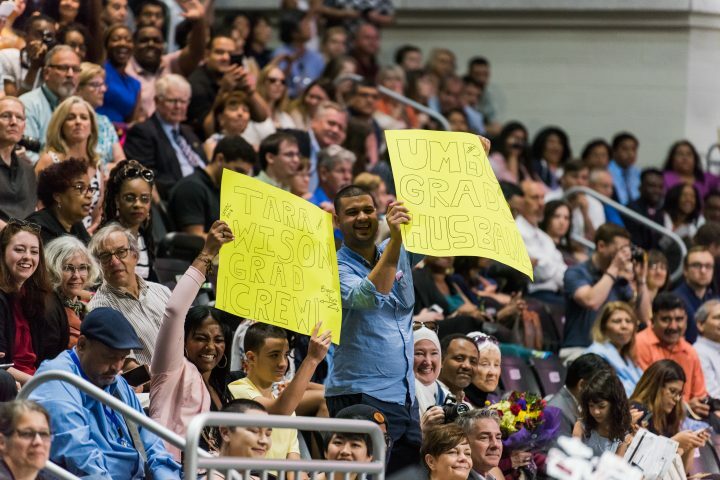 The new arena quickly filled with crowds of cheering supporters, with more tuning in to UMBC’s live webcasts from around the globe. The class of 2018 receives thunderous support from the crowd during this year’s commencement exercises. The graduate commencement ceremony, for students earning master’s and doctoral degrees, took place on Wednesday, May 23. The ceremony included remarks by honorary degree recipient Erin O’Shea, the first female president of the Howard Hughes Medical Institute (HHMI). Erin O’Shea, president of Howard Hughes Medical Institute, delivered the graduate commencement address as an honorary degree recipient. As I look around this room, I see a lot of powerful individuals. I see individuals who are true to themselves. I see individuals who will have a seat at the table and who will pull up a chair for others. I see individuals who will listen and be heard. I see individuals moving towards greatness. UMBC hosted two undergraduate ceremonies on Thursday, May 24, including a morning commencement for the College of Arts, Humanities, and Social Sciences, School of Social Work, and Erickson School, and an afternoon ceremony for the College of Natural and Mathematical Sciences, College of Engineering and Information Technology, and Interdisciplinary Studies. The class of 2018 prepares to turn their tassels. 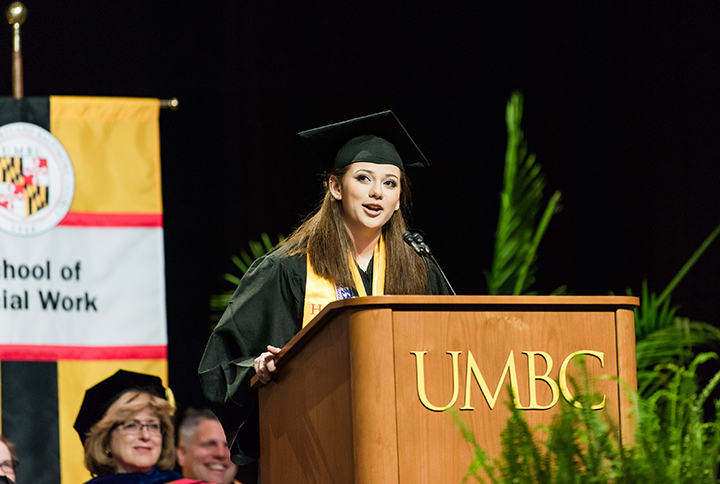 Kara Seidel ’18, psychology, valedictorian of the morning ceremony, shared her family’s deep connection to UMBC, where her parents and brother also earned their degrees. She reflected that, initially, she was uncertain about whether she could create her own unique path at the university. But once she stepped onto campus, she joked, “the UMBC community sucked me in,” and her college career was full speed ahead. Valedictorian Kara Seidel addresses the class of 2018. While studying at UMBC, Seidel accessed opportunities to work in the Trauma Lab of Christopher Murphy, professor and chair of psychology; in an HIV/addiction lab at Johns Hopkins; and at the American Psychological Association. These experiences helped her identify her core interest in the field of psychology: supporting families dealing with trauma. 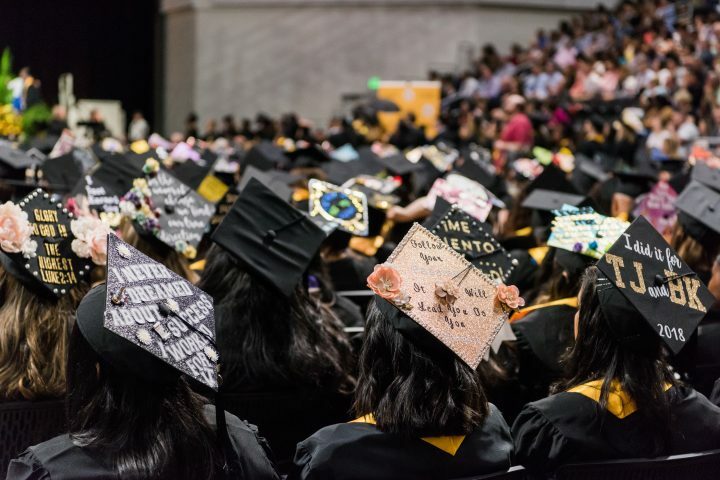 A sea of decorated caps filled the UMBC Event Center. Honorary degree recipient Ted Mitchell, president of the American Council on Education, addressed graduates in the morning ceremony. “Achieving excellence, no matter what your background, that’s the greatest victory of all,” he reflected. He also brought some levity to the festivities in recalling UMBC’s history-making NCAA victory, joking that UMBC helped advance his bracket because he chose his winning teams based on academic reputation. Ted Mitchell delivers his commencement address. 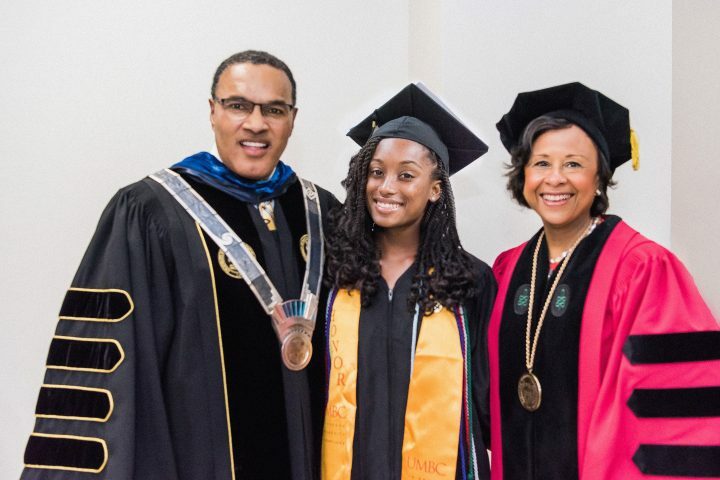 L-R: President Hrabowski, valedictorian Eudorah Vital, and honorary degree recipient Paula A. Johnson pose for a quick photo before the final 2018 commencement ceremony. Vital became highly involved in research beginning in her freshman year, as a Meyerhoff Scholar, MARC U*STAR, and Howard Hughes Medical Institute Scholar. She has already co-authored two papers in top academic journals, and a third is coming soon. Her interest in completing clinically relevant research in an inclusive scientific community, like the one she found at UMBC, led her to select Emory University’s M.D./Ph.D. program in neurobiology as her next step. Valedictorian candidate Daniel Morris takes a moment to bid farewell. 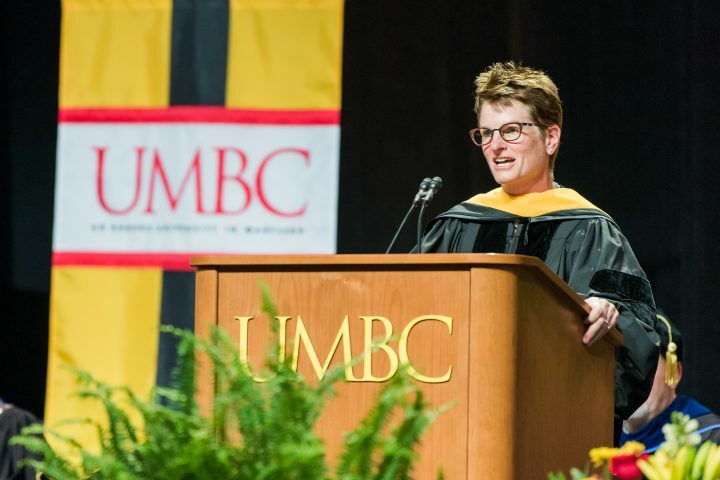 Michelle Gourdine represented the University System of Maryland Board of Regents at the ceremonies, and shared her perspective on UMBC’s success. 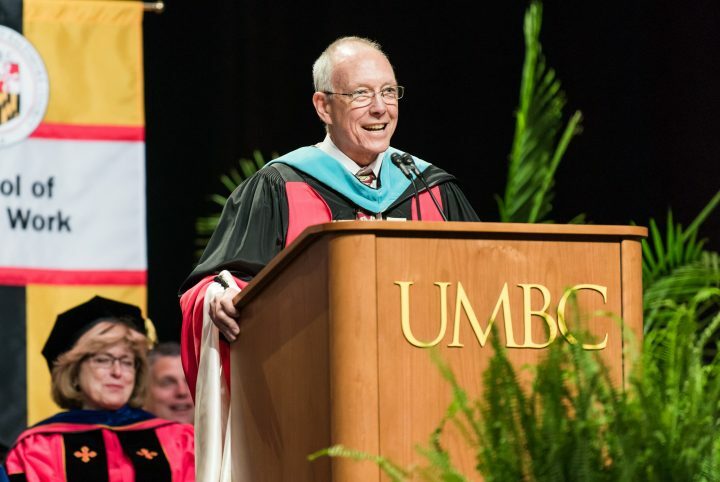 “By any measure—national rankings, research partnerships, public service activities, faculty accomplishments, student achievements…and let’s not forget athletic achievement—UMBC stands as one of the finest universities in the country,” she said. 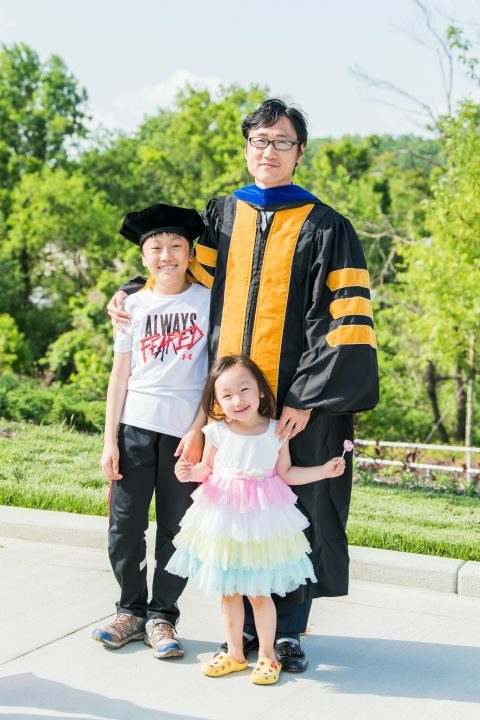 Peng Chu celebrates with his family after being awarded his Ph.D.
President Hrabowski’s remarks this year focused on an appreciation for the value of truth and integrity, as well as service and commitment to community. He took time to honor veterans and graduating students who will pursue careers in social work and teaching. He also encouraged guests to read UMBC’s Class of 2018 feature, which highlights the personal stories of 43 Retrievers recognized for academic excellence and demonstrating a commitment to a greater good through research, scholarship, creativity, and work with underserved communities. 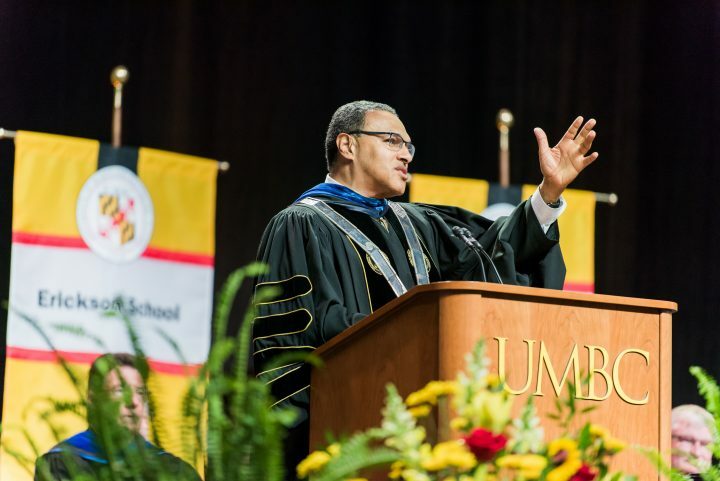 President Hrabowski addresses UMBC graduating class of 2018. Your dreams, and more importantly, your character will determine who you become. Your character will be reflected most clearly in the courage you possess and the compassion you show for others. A UMBC graduate celebrates the conclusion of her college career. 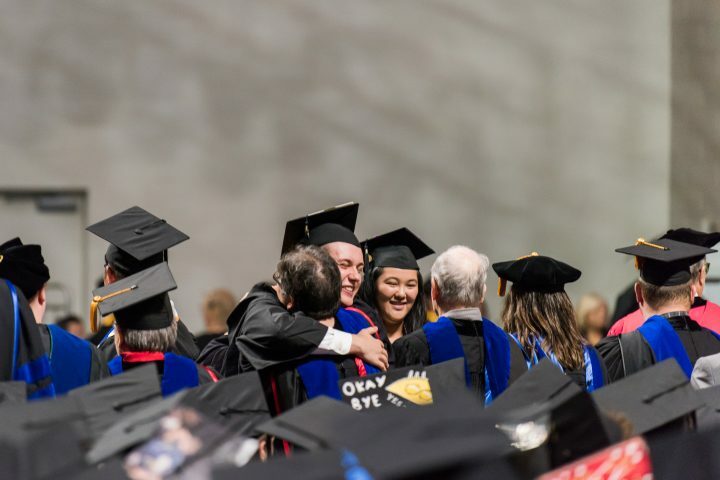 Videos of President Hrabowski’s full remarks, as well as those of the honorary degree recipients; valedictorians; Graduate Student Association President Roy Prouty, M.S. ’16, atmospheric physics, M.S. ’19 computer science; and others are now available with captioning on UMBC’s YouTube and below. 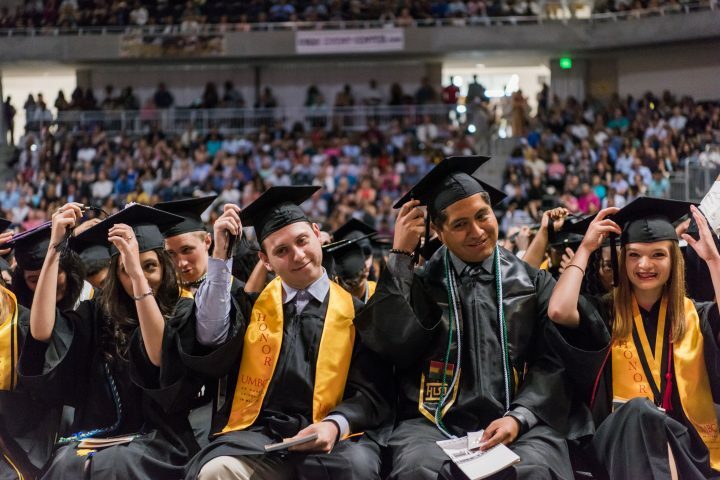 Graduates and those cheering them on can share memories, well wishes, and photos through #UMBCgrad, and view UMBC’s Facebook page, Instagram, and Twitter accounts for coverage of the festivities. Header image: CWIT Scholars celebrate together one last time. All photos by Marlayna Demond ’11 for UMBC.